Railpictures.ca - Bill Hooper Photo: Kettle Falls International Railway a division of Omnitrax operates former BN nee GN lines north of Spokane and into Canada at Grand Forks and stub of former line to Nelson to serve a reload for Cominco-Tech smelter at Trail. The northbound from HQ at Kettle falls has just cleared customs, the border station is behind the trees, and crosses the Pend Oreille River at its confluence with the Columbia. | Railpictures.ca – Canadian Railway Photography – photographie ferroviaire Canadienne. Caption: Kettle Falls International Railway a division of Omnitrax operates former BN nee GN lines north of Spokane and into Canada at Grand Forks and stub of former line to Nelson to serve a reload for Cominco-Tech smelter at Trail. 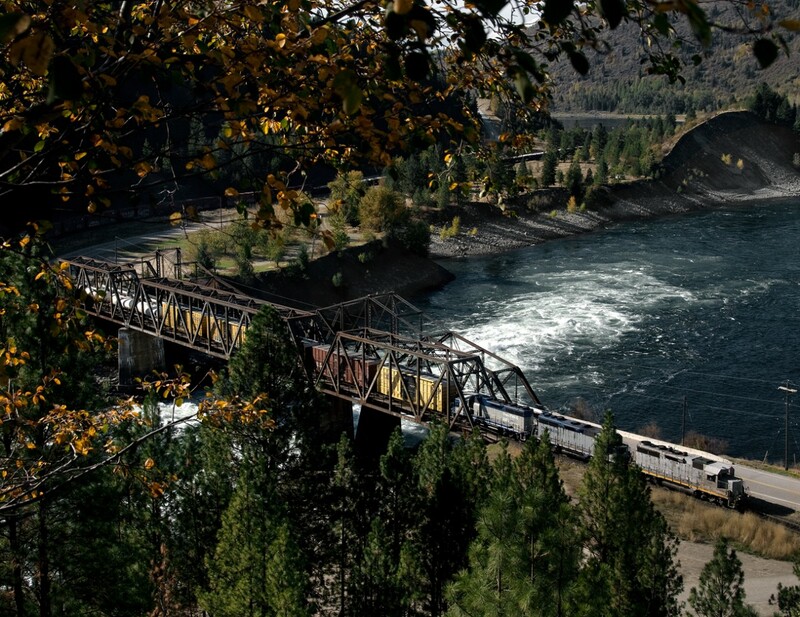 The northbound from HQ at Kettle falls has just cleared customs, the border station is behind the trees, and crosses the Pend Oreille River at its confluence with the Columbia. Just north of the 49th parallel, neat spot and neat photo! Awesome photo of a rarely seen operation!